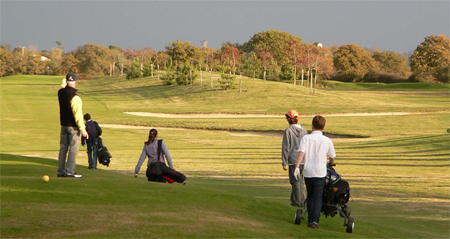 If Golf is your passion then the Vendée has just what you’re looking for. With 5 courses within the Vendée and several others in the departments that surround it there is an excellent choice. Don't worry if you left your clubs at home, you can hire everything at the courses. This Yves Bureau designed course is best known for its driving range. The course itself takes you through pine and oak forest with a succession of water features and hedgerows. Water hazards especially the lake in front of the green at the 10th, need to be considered carefully when playing this course. Practice facilities. Practice ground with 25 places 10 of which are undercover, 2 putting greens, and fairway. This course has the highest slope in France with plenty of lakes and ponds there are a wealth of shots to be played. It is a delightful course and those in search of new challenges will want to experience it. Practice facilities. 4 compact holes, fairway and practice ground with 8 places under cover. Golf Olonne. Tel. 02 51 33 16 16 3 km from les Sables d'Olonne. Practice facilities. 6 covered, 20 non covered, putting green and approach. Green Fees €18 low season. €39 mid season, €49 high season. St Jean de Monts. Avenue des pays de la Loire. This 18 hole Yves Bureau designed course is styled on a traditional Scottish links course and most reviews rate this as the best course in western France. 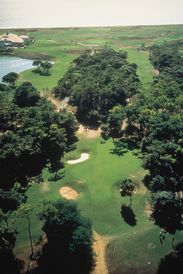 The front 9 holes wind through a natural pine forest while the back 9 are close to the beach with great views of the ocean and the Ile d'Yeu, and there are a lot of water hazards. The undulating fairways are an excellent test for technical golfers. There is a Practice green. 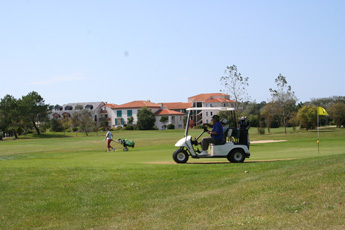 Green fees for winter 2009 are from €22. Port Bougenay. Talmont St. Hilaire. Tel 02 51 23 35 45. 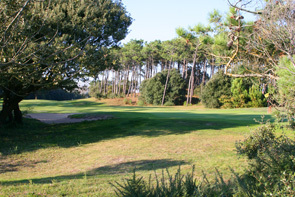 The P. Thevenin designed course overlooks the marina of port Bougenay, and is bordered by a pine forest on the very edge of the sea. The 85 hectare course has alternative pine forest and hedgerows giving two differing experiences. Practice Grounds. Both (in the) open air and under cover, together with a putting green and a fairway. La Pree, Marsilly, La Rochelle. Tel 05 46 01 24 42. Fees. Solo €44 to € 56 depending on the season. Traditional links course, with shrubs, ponds and a stream. Fits t9 holes with wide fairways and well guarded sloping greens. There are many bunkers and it has little protection from the often strong sea breezes. The inward 9 holes have narrow fairways ponds and streams. This course will suit all standards of player. Par 71. 5868m Architect. Robert Berthet 1984. This is a flat course which shares a few holes with the race course. It has well defended greens with bunkers and ponds, narrow fairways make it a technically demanding course. Practice facilities Chip and put greens, bunkers and a 20 place driving range 12 of which are under cover. Mini Golf. While many traditionalists would not call this golf, there are never the less many visitors who want to partake in this popular casual entertainment. The following are Mini Golf courses in the Vendée. La Faute-sur-Mer. Ave de la Plage. Les Sables d'Olonne JOA Casino Pins, 14 Ave Rhin & Danube. La Tranche: 9 Ave des Nolleaux. La Griere Plage. St. Jean-de-Monts. Le Marais, 64,rue Notre-Dame-de-Monts.